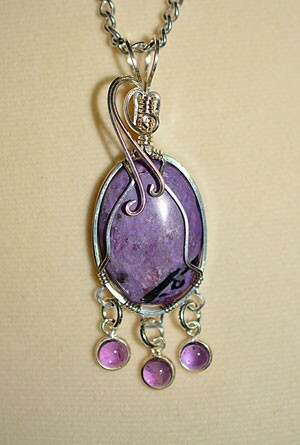 This pendant is very delicate looking and the amethyst dangles add an unusual look. Once you have learned the technique of making squares in wire you will be able to vary your designs. No longer do you need to have stone or glass pieces that have holes already drilled! Image if you had several stones or glass pieces (with no pre-drilled holes) and you wanted to create a necklace? Now you can! Learn about wire temper, gauges, and wire shapes as well as tools. You will learn how to measure enough wire, how to bind your bundle of wire, how to make a bail, how to make squares in wire, how to attach “dangles”, and how to make an attractive pendant. Inasmuch as all tools are provided during the workshop, all you need to bring is a willingness to learn! For more information and to sign up for the workshop email Merilou at meriloupjenkins@yahoo.com or call 951.634.4302. Class size is limited to 8 so register early! Fee includes four hours of instruction, a charoite cabochon (which is a one source gemstone from the Charo River area in Russia), sterling silver wire, Amethyst stones wrapped in sterling silver for the “dangles”, sterling silver headpins, a jeweler’s polishing cloth, a fleece work surface and a copy of her 12 page instruction book featuring complete instructions with color step by step photographs, all of which is yours to take home. She will also provide all tools for you to use in class so it is not necessary for you to bring anything.